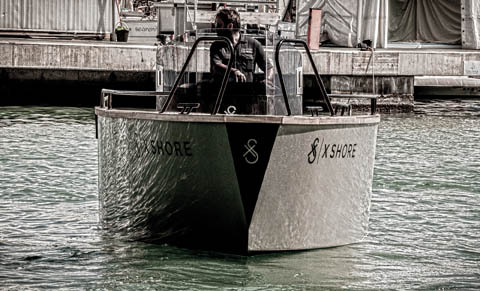 X Shore is a Swedish, first class manufacturer of eElectric crafts. Develop, market, distribute and sell products and services globally. The multidisciplinary team has over 100 years of boat-building expertise. In addition to this, several members of our team also hail from the tech industry and have experience developing brands that have gone on to become global success stories. The X Shore eElectric 8000 has an advanced propulsion system with dual inboard motors and batteries. Each of the two Torqeedo Deep Blue 80i 1800 engines delivers 80 horsepower, which is enough for speeds in excess of 25 knots. The BMW batteries feature an advanced water-cooling system that provides longer battery life and maximum performance, giving the eElectric 8000 a range of up to 40 nautical miles. When the design of X Shore eElectric 8000 Smögen Edition was conceptualized, the goal was to create a boat that was slim, streamlined, environmentally friendly and equipped functionality and practical design details. The X Shore eElectric 8000 has a distinctive Scandinavian design with clean, minimalist lines. The eElectric 8000 has an extremely lightweight hull designed to take in air from the sides, thus creating a layer of air bubbles between the hull and the water. This leads to reduced friction and energy saving. Together with two propeller tunnels, the eElectric 8000 glides smoothly through the water.